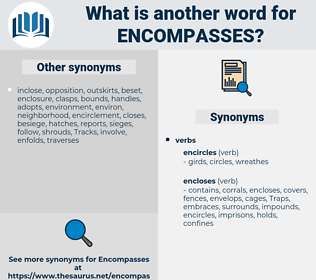 What is another word for encompasses? spans, subsections, concerns, aims, coats, Scales, Addresses, offers, blankets, displays, captures, targets, features, Houses, attempts, pillars, touches, lists, accords, deals, Backs, sets, involves, consists, contains, understands, included, provides, comprise. 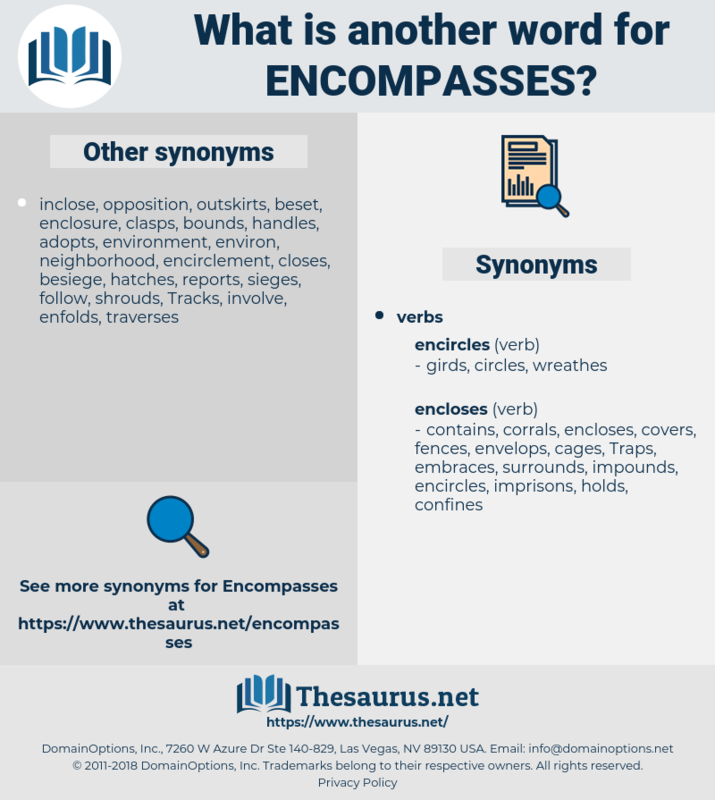 encapsulates, Comprised, Comprising, corresponds, encloses, complements, Including, passes, Consisting, envisions, represents, Containing, pertains, possesses, accommodates, constitutes, cover, covering, processes, demonstrates, concentrates, contemplates, necessitates, broadens, enables, presents, combines, comprehends, encourages, consolidates, implements, subsumes, enjoys, endorses, participates, reflects, coincides, responds, mainstreams, integrates, caters, connotes, enforces, assesses, specifies, Affects, mainstream, acknowledges, embodies, depicts, employs, belongs, ranges, spreads, occupy, occupies, extends, stretches, envisages, overlaps, summarizes, engages, imposes, enshrines, indicates, implicates, excludes, mentions, conceals, expands, describes, manages, correlates, poses, restricts, accompanies, afflicts, removes, sympathizes, endeavours, assumes, revolves, designates, suggests, governs, considers, oversees, connects, illustrates, enrolls, completes, presupposes, impinges, explores, intersects, boasts, ensures, prescribes, espouses, anticipates, contributes, accepts, hangs, proposes, stipulates, straddles, explains, signifies, reproduces, Comes, appends, Focuses, focusses, amalgamates, presumes, is, supplements, translates, applies, implies, associates, speaks, assembles, refers, foresees, convenes, protects, appoints, summarises, outlines, reaches, replicates, reintroduces, appears, overlays, denotes, generates, spends, depends, investigates, classifies, nominates, discusses, defines, surfaces, parallels, introduces, utilizes, supports, recognises, performs, handles, attracts, means, produces, infects, restates, surrounds, crosses, IMPACTS, compiles, examines, gathers, repeats, becomes, supposes, Permits, enters, achieves, observes, satisfies, perceives, identifies, operates, realises, reiterates, pursues, merges, joins, insures, helps, echoes, cites, assures, renews, purports, locates, adds, equates, collates, packages, area, overlies, underlies, serves, Bears, frames, sends, essential, lies, spans, uses, submits, tackles, forecasts, predicts, adopts, victimises, infers, sees, shows, notably, inherits, prints, unites, persists, reveals, agrees, teaches, strives, starts, articulates, SITS, Plays, leads, occurs, resumes, situates, recovers, publishes, follows, kisses, earns, matches, seeks, realizes, touch, plans, owns, collects, includes, aligns, incurs, regains, evaluates, recognizes, brings, totals, Has, attaches, secures, creates, fulfils, feels, befits, regulates, delivers, amounts, allows, limit, limits, Guards, mirrors, confronts, Faces, embeds, nears, reverts, harbours, fulfills, receives, regroups, highlights, treats, requires, upholds, intrudes, expects, hosts, comprises, pays, commits, undermines, feeds, retains, urges, thrives, writes, hinges, continues, fills, unifies, relies, assists, honors, account, accounts, regards, turns, ranks, fits, stores, lays, asks, covers, counts, determines, Tracks, packs, closes, concerns, wears, aggregate, aggregates, Watches, links, Carries, exhibits, Gives, hurts, draws, behaves, maintains, Forms, intends, affords, conducts, Travels, Strikes, raises, Hires, greets, reviews, believes, aims, borrows, undertakes, knows, heads, holds, Rallies, lasts, hearing, hears, establishes, Rests, finds, returns, takes, falls, meets, hugs, Addresses, offers, lacks, reads, looks, displays, goes, captures, fixes, builds, trusts, targets, hits, features, Houses, runs, attempts, puts, touches, acts, lists, pulls, tries, Does, deals, gets, makes, sets, involves, cuts, consists, contains, understands, embrace, embraces, provides.